, eldest son of the preceding, and one of the most turbulent enthusiasts which the rebellion produced, was born in 1612, and educated at | Westminsterschool, whence he went to Magdalen-hall, Oxford, and even at this early age seems to have embraced some of those republican opinions which were destined to plunge his country in all the miseries of anarchy. He is said to have then travelled to France and Geneva, and on his return betrayed such an aversion to the discipline and liturgy of the Church of England, as greatly displeased his father. Finding how obnoxious his principles made him, he determined to go to New England, then the resort of all who were disaffected to the Church of England. His father was against this wild scheme, but, according to Neal (in his History of New England), the king advised him to consent to it, and to limit his stay to three years. Young Vane’s purpose was to have begun a settlement on the banks of the river Connecticut; but the people upon his arrival, in 1635, complimenting him with the government of Massachusetts for the next year, he resolved to stay among them. 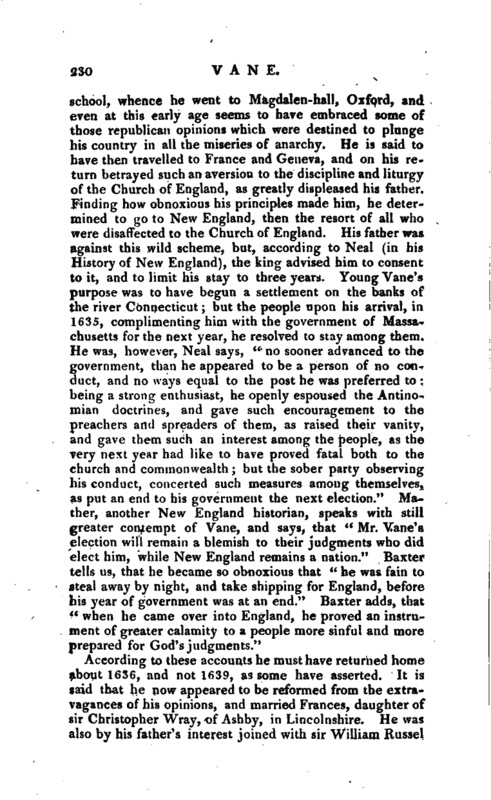 He was, however, Neal says, ' no sooner advanced to the government, than he appeared to be a person of no conduct, and no ways equal to the post he was preferred to: being a strong enthusiast, he openly espoused the Antinomian doctrines, and gave such encouragement to the preachers and spreaders of them, as raised their vanity, and gave them such an interest among the people, as the very next year had like to have proved fatal both to the church and commonwealth; but the sober party observing his conduct, concerted such measures among themselves, as put an end to his government the next election.“Mather, another New England historian, speaks with still greater contempt of Vane, and says, that” Mr. Vane’s election will remain a blemish to their judgments who did elect him, while New England remains a nation.“Baxter tells us, that he became so obnoxious that” he was fain to steal away by night, and take shipping for England, before his year of government was at an end,“Baxter adds, that” when he came over into England, he proved an instrument of greater calamity to a people more sinful and more prepared for God’s judgments." According to these accounts he must have returned home about 1636, and not 1639, as some have asserted. It is said that he now appeared to be reformed from the extravagances of his opinions, and married Frances, daughter of sir Christopher Wray, of Ash by, in Lincolnshire. He was also by his father’s interest joined with sir William Russel | in the office of treasurer of the navy, a place of great trust and profit. He represented Kingston-upon-Hull in the parliament chosen 1640, and for some time seemed well satisfied with the government; but, upon his father’s taking umbrage at the lord Strafford’s being created in 1639 baron Raby (which title he had promised himself, and which Strafford laid hold of, merely out of contempt to the Vanes), both father and son formed a resolution of revenge. For this purpose the latter, who had received the honour of knighthood in 1640, joined Pymand other declared enemies of the court; and contributed all that intelligence which ended in the ruin of the earl, and which fixed himself in the entire confidence of the enemies of the king and of StrafFord, so that nothing was concealed from him, though it is believed that he communicated his thoughts to very few. Upon the breaking out of the rebellion he adhered to the interest of the parliament with enthusiastic zeal. He began with carrying to the House of Peers the articles of impeachment against archbishop Laud; and was nominated one of the ]ay members of the assembly of divines. In 1643 he was appointed one of the commissioners sent by parliament to invite the Scots to their assistance. 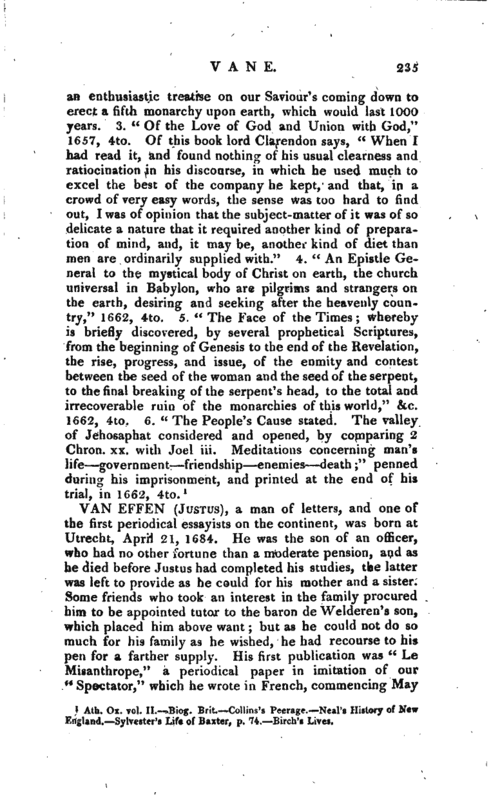 Under this character he distinguished himself as the “great contriver and promoter of the solemn league and covenant;” though, even at that time, he was known to have an equal aversion to it and to presbytery, which he demonstrated afterwards upon all occasions, being a zealous independent. In 1644, he was the grand instrument of carrying the famous self-denying ordinance, a delusive trick, which for a time gave life and spirit to the independent cause; and in his speech, upon introducing the debate on that subject, observed, that, though he had been possessed of the treasurership of the navy before the beginning of the troubles, without owing it to the favour of the parliament, yet he was ready to resign it to them; and desired that the profits of it might be applied towards the support of the war. He was likewise one of the commissioners at the treaty of Uxbridge, in Jan. 1644-5, and of that of the Isle of Wight in 1648; in which last, as he was now determined to procure, if possible, a change in the government, he used all his efforts to retard any conclusion with his majesty till the army could be brought to London; and for that purpose amused the king’s party by the offer of a toleration for the | common prayer and the episcopal clergy. 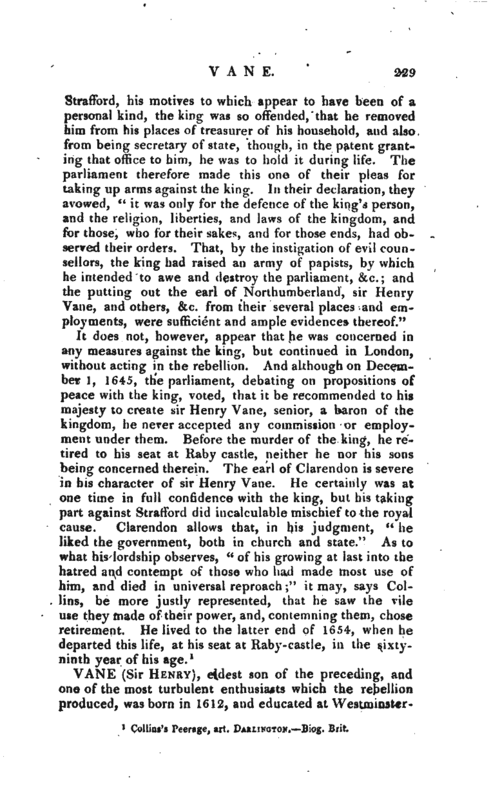 Like many others, however, he did not foresee the consequences of his favourite measures, and therefore did not approve of the force put upon the parliament by the army, nor of the execution of the king; withdrawing for some time from the scene while these things were acted. But, upon the establishment of the commonwealth, 1648-9, he was appointed one of the council of state, in which post he was continued till the memorable dissolution of the parliament by Cromwell in 1643. On this occasion Cromwell, who treated individual members with personal insolence, took hold of sir Henry Vane by the cloak, saying, “Thou art a juggling fellow.” Vane, however, was too much of a republican to submit to his, or any authority, and was therefore, in 1656, summoned by Cromwell to appear before him in council. 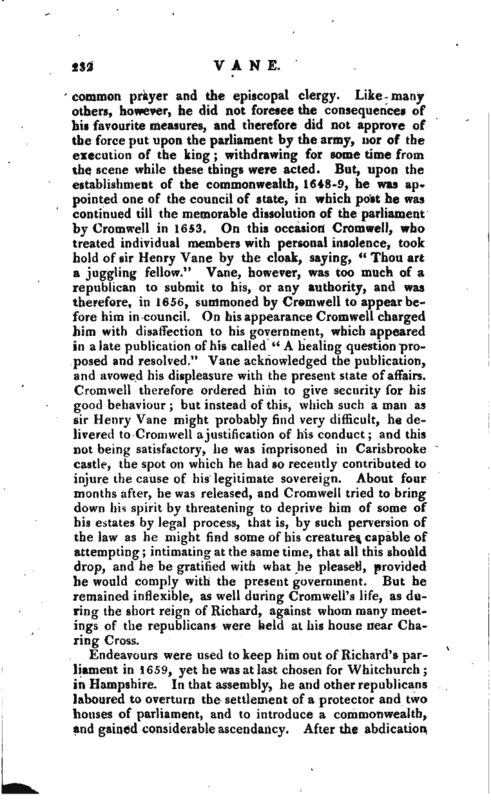 On his appearance Cromwell charged him with disaffection to his government, which appeared in a late publication of his called “A healing question proposed and resolved.” Vane acknowledged the publication, and avowed his displeasure with the present state of affairs. Cromwell therefore ordered him to give security for his good behaviour; but instead of this, which such a man as sir Henry Vane might probably find very difficult, he delivered to Cromwell a justification of his conduct; and this not being satisfactory, he was imprisoned in Carisbrooke castle, the spot on which he had so recently contributed to injure the cause of his legitimate sovereign. About four months after, he was released, and Cromwell tried to bring down his spirit by threatening to deprive him of some of his estates by legal process, that is, by such perversion of the law as he might find some of his creatures capable of attempting; intimating at the same time, that all this should drop, and he be gratified with, what he pleased, provided he would comply with the present government. But he remained inflexible, as well during Cromwell’s life, as during the short reign of Richard, against whom many meetings of the republicans were held at his house near Charing Cross. Endeavours were used to keep him out of Richard’s parliament in 1659, yet he was at last chosen for Whitchurch; in Hampshire. In that assembly, he and other republicans laboured to overturn the settlement of a protector and two houses of parliament, and to introduce a commonwealth, and gained considerable ascendancy. After the abdication. | of Richard, the long parliament was restored, and sir Henry Vane made one of the committee of safety, and one of the council of state, and finally president of the council, at which time he proposed a new model of republican government. Still, however, he had the misfortune to displease his associates, and his temporary grandeur ended in their confining him to his house at Raby, in the county of Durham. Upon the restoration it was imagined, that, as the declaration from Breda was full of indemnity to all except the regicides, he was comprehended in it; his innocence of the king’s death was represented in such a manner by his friends, that an address was agreed upon by both houses of parliament in his behalf, to which a favourable answer, though in general terms, was returned by his majesty; and this being equivalent to an act of parliament, though it wanted the necessary forms, he was thought to be secure. 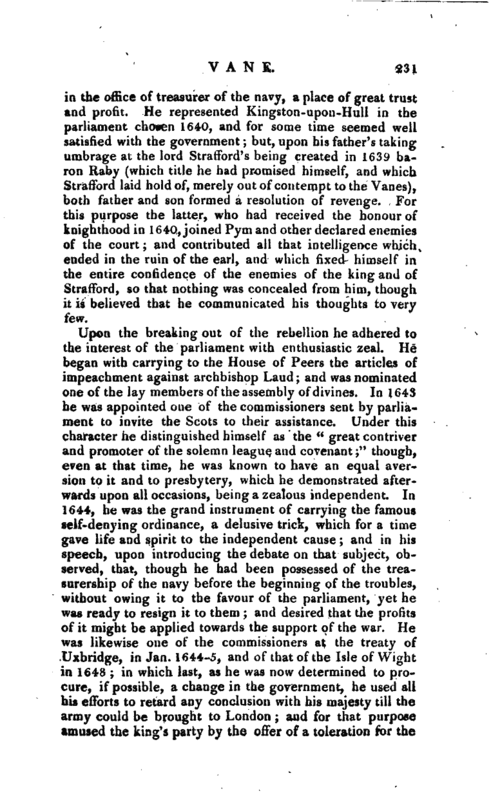 But the share he had in the attainder of the earl of Strafford, and in all the violent measures which overturned the government, and, above all, the great opinion which was entertained of his parts and capacity to embroil matters again, made the court think it necessary to include him among the most dangerous enemies of the restoration. 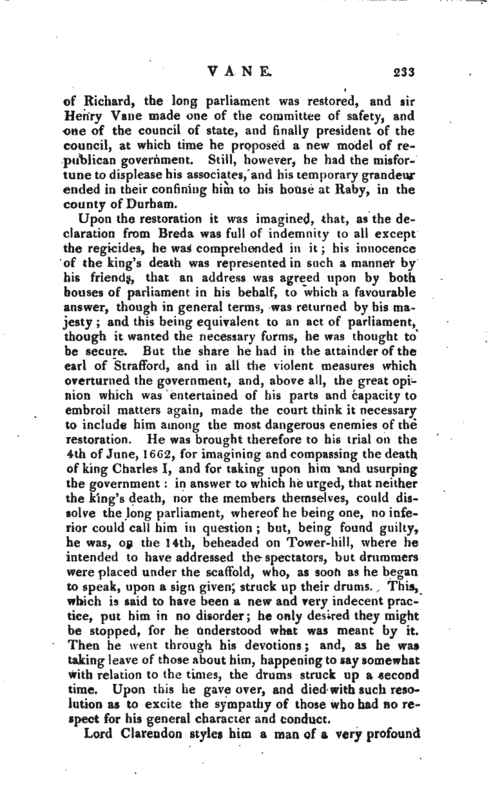 He was brought therefore to his trial on the 4th of June, 1G62, for imagining and compassing the death of king Charles I, and for taking upon him and usurping the government: in answer to which he urged, that neither the king’s death, nor the members themselves, could dissolve the long parliament, whereof he being one, no inferior could call him in question; but, being found guilty, he was, on the 14th, beheaded on Tower-hill, where he intended to have addressed the spectators, but drummers were placed under the scaffold, who, as soon as he began to speak, upon a sign given, struck up their drums. This, which is said to have been a new and very indecent practice, put him in no disorder; he only desired they might be stopped, for he understood what was meant by it. Then he went through his devotions; and, as he was taking leave of those about him, happening to say somewhat with relation to the times, the drums struck up a second time. Upon this he gave over, and died with such resolution as to excite the sympathy of those who had no respect for his general character and conduct. Lord Clarcndoq styles him a man of a very profound | dissimulation, of a quick conception, and very ready, sharp, and weighty, expression; of a pleasant wit, a great understanding, which pierced into and discerned the purposes of other men with wonderful sagacity, whilst he had himself vtdtum clausum, that no man could make a guess of what he himself intended; of a temper not to he moved, though compliant, when it was not seasonable to contradict, without losing ground by the condescension. 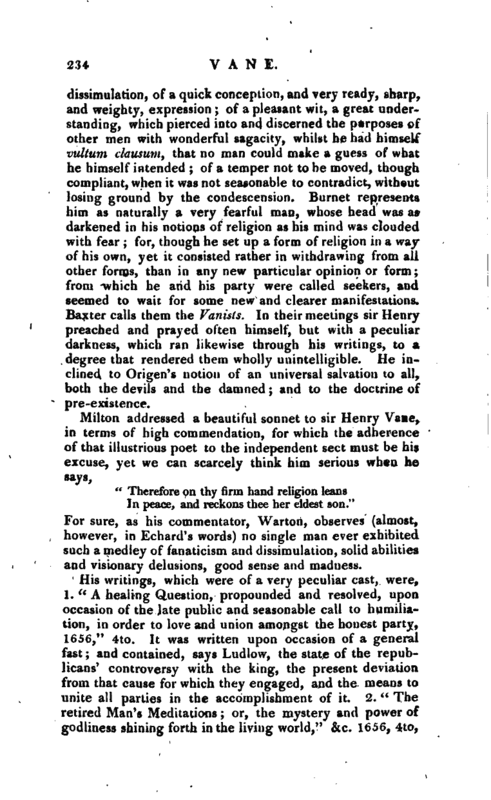 Burnet represents him as naturally a very fearful man, whose head was as darkened in his notions of religion as his mind was clouded with fear; for, though he set up a form of religion in a way of his own, yet it consisted rather in withdrawing from all other forms, than in any new particular opinion or form; from which he and his party were called seekers, and seemed to wait for some new and clearer manifestations. Baxter calls them the Vanuts. In their meetings sir Henry preached and prayed often himself, but with a peculiar darkness, which ran likewise through his writings, to a degree that rendered them wholly unintelligible. He inclined to Origen’s notion of an universal salvation to all, both the devils and the damned; and to the doctrine of pre-existence. In peace, and reckons thee her eldest son." For sure, as his commentator, Warton, observes (almost, however, in Echard’s words) no single man ever exhibited such a medley of fanaticism and dissimulation, solid abilities and visionary delusions, good sense and madness. 1 Ath. Ox. vol. II. Biog. Brit. Collins’s Peerag*. Neal’s History of New England. Sylvester’s Life of Baxter, p. 74. Birch’s Lives.